Hello my beautiful, creative friends! 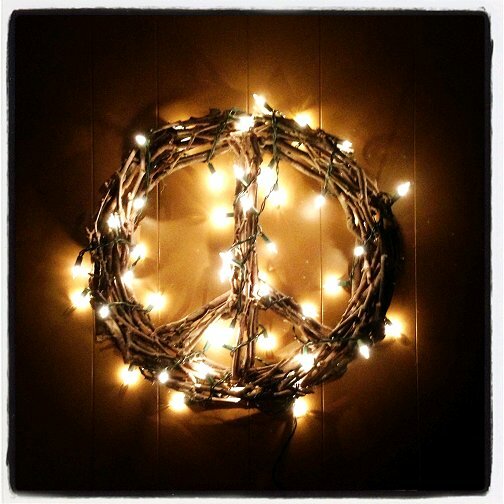 Ready to spread a little peace today? 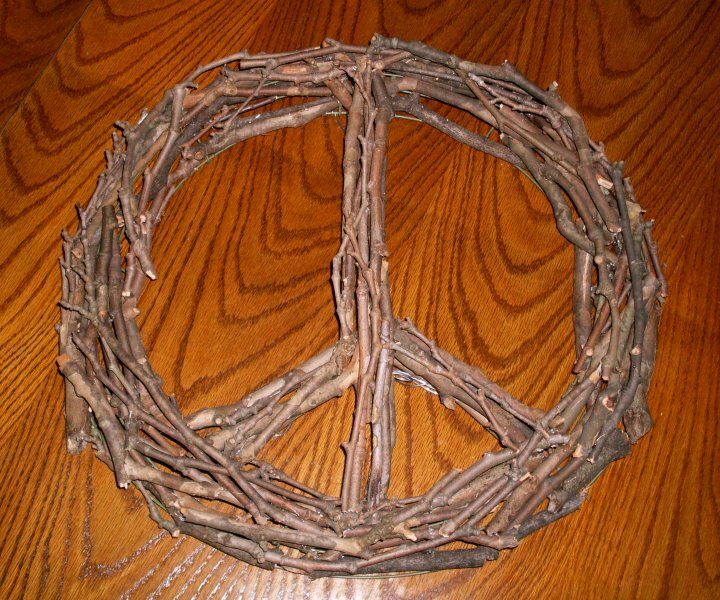 One wire wreath form- costs a few bucks and is available at most craft stores. I bought this old one that I used for this project at my local Goodwill store for 50 cents! 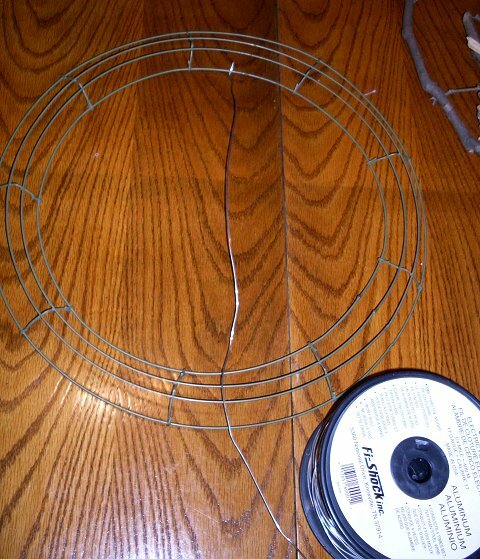 Wire - I am using a spool of aluminum electric fence wire that I bought at Home Depot. I love this wire! 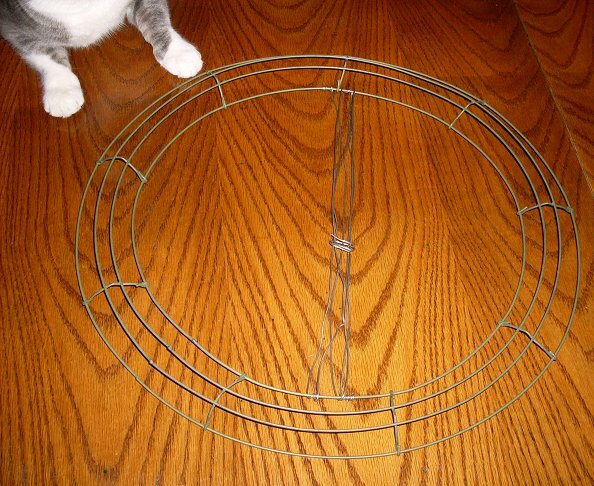 You can use it for so many great crafting projects! 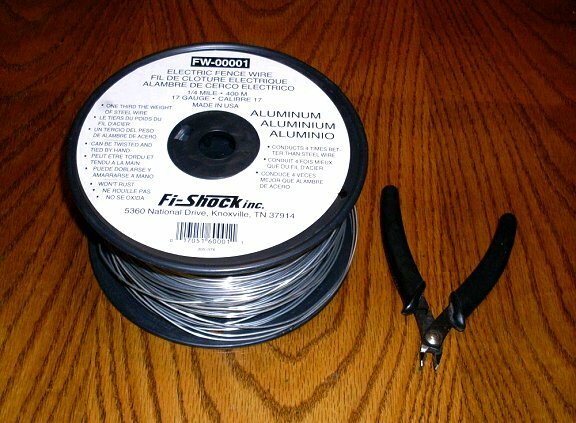 I'll write more about that in another post though, just get yourself a spool of pliable wire and you'll be good to go. A glue gun and glue sticks for the glue gun - nothing fancy. 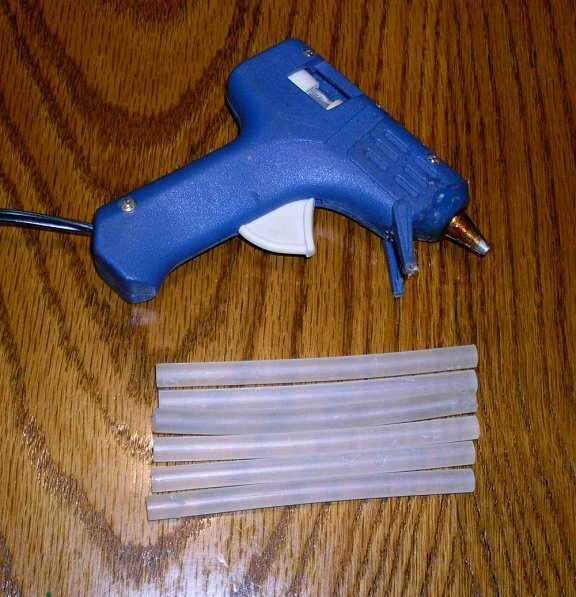 I use a small $5 glue gun that I've had for 20 years. Twigs, sticks, and branches - go to your backyard and gather an armful. 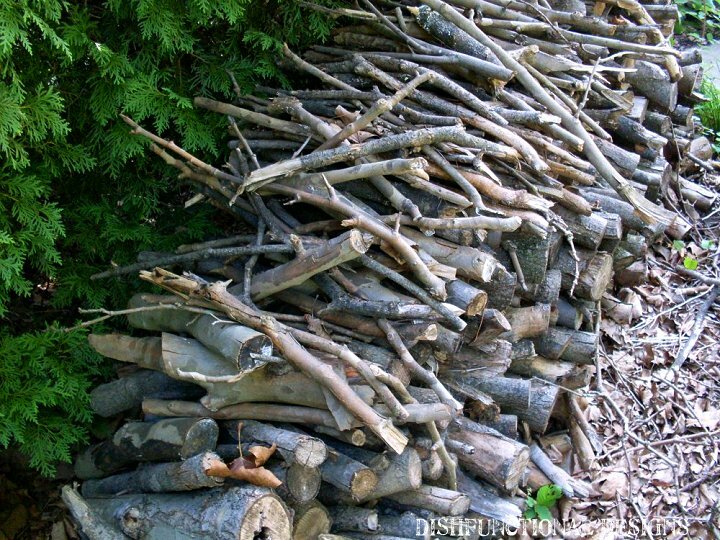 I am fortunate enough to have this twig pile in my backyard. Yay. 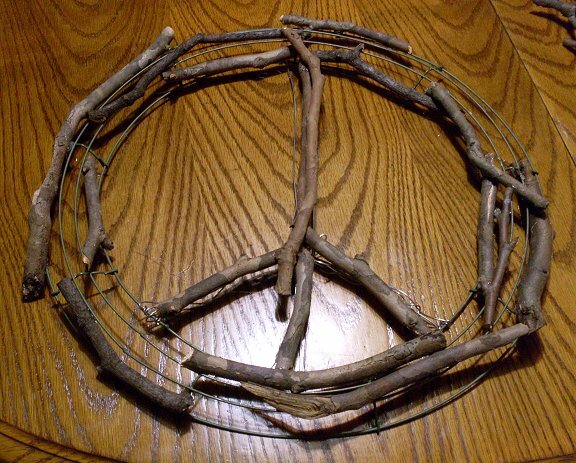 The first thing you need to do is create a peace sign shaped base to glue the branches on. 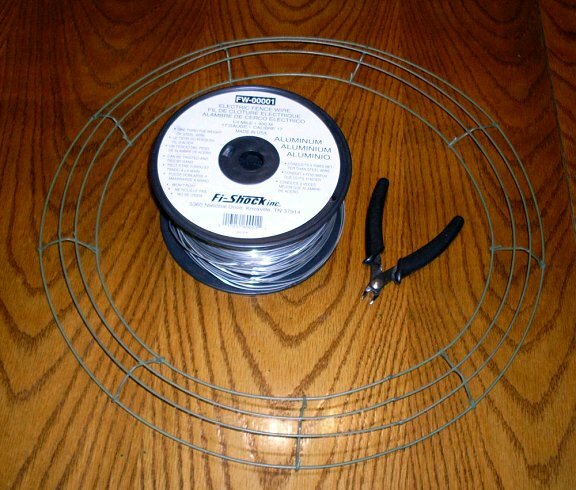 You will create that inside your wire wreath form using the fencing wire. 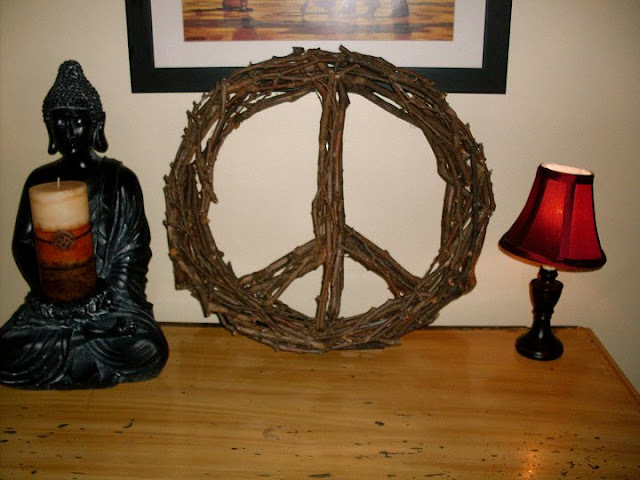 You will begin by creating the long vertical slash that forms the center of the peace sign. 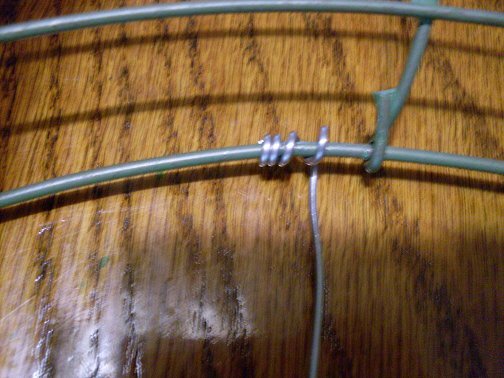 To begin, cut a length of fencing wire, I used about 3 & 1/2 feet. 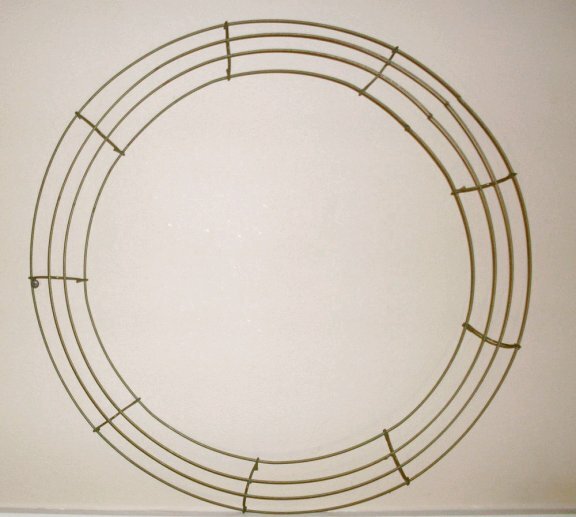 Take one end of the wire and carefully wrap it around the inner most wire at top center of your wire wreath form. Make your wraps as snug as you can. I went around about four times. 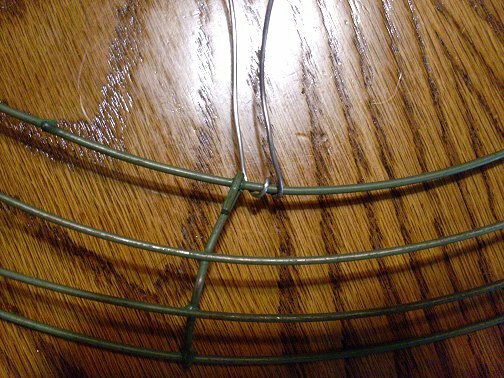 Then clip off the extra little end of wire with your wire cutters. Next, pull your wire down the center of the wreath form to the opposite end and wrap around the inner most wire of the bottom of the wreath form (same as you did at the top) - I wrapped the wire twice around at this spot. 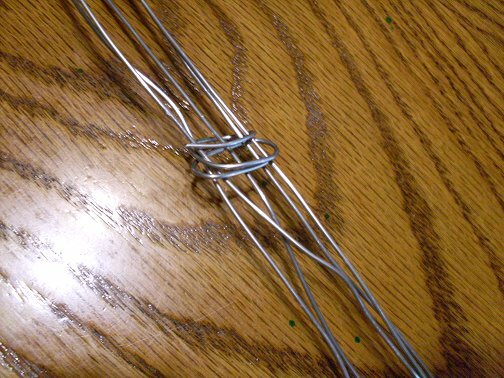 After you do that, again bring the wire back up to your first wrap at the top of the wreath form and wrap twice next to your first wrap, then again to the bottom, repeating until you use your entire length of wire. Four or five times should do it. 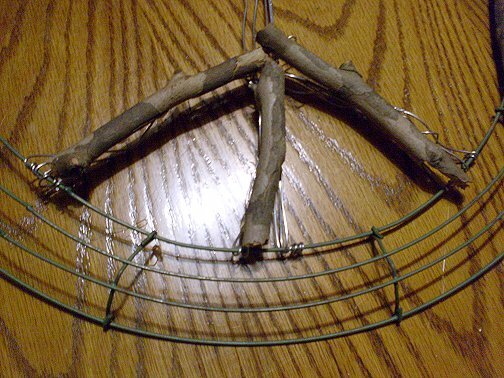 Don't worry about the wire being a little bit crooked or kinked, you are only building a base to glue the branches onto and all the wire will eventually be covered with twigs and branches, so no worries. 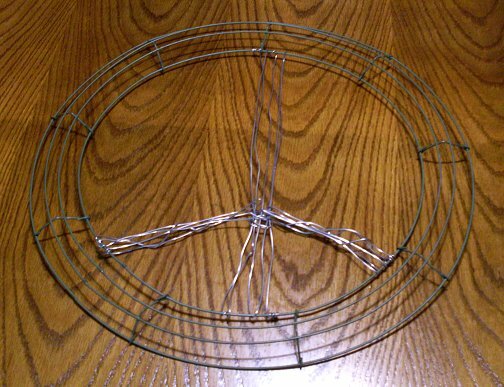 Once I finished the long vertical center slash, I cut a piece of wire about 6 inches long and wrapped it around all of my center wires to gather them together a bit. 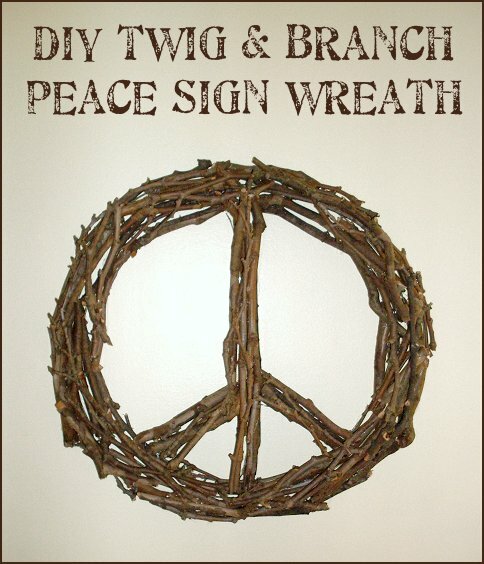 Next, create the rest of the peace sign by forming the left and right slanted slashes. 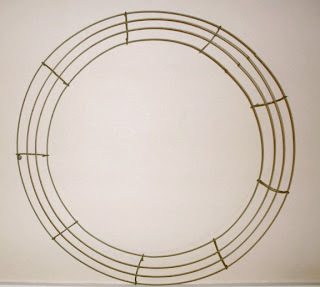 I used the same process as described above, but with a bit less wire, about 2 feet for each side slash. Start on either the left or right side, and begin wrapping on the wreath form, and then bring the wire to your center slash where you wrapped that 6" piece of wire and wrap through that, and repeat as you did above until all of your wire is used up. 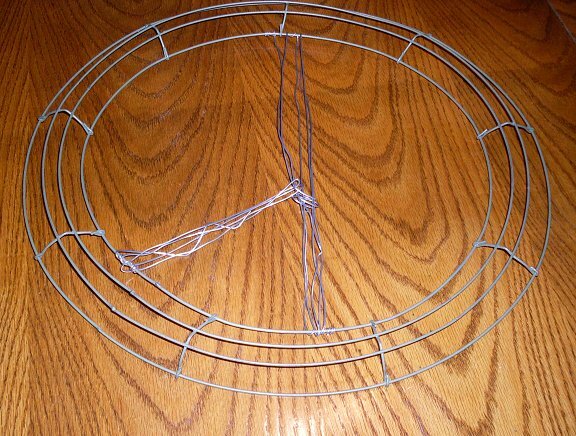 When finished, snip off any excess pointy ends of wire. Now your base is finished! I began by adhering thicker branches first, then the medium sized ones, and saved the smaller, thinner ones to fill in spaces when it was nearly finished. 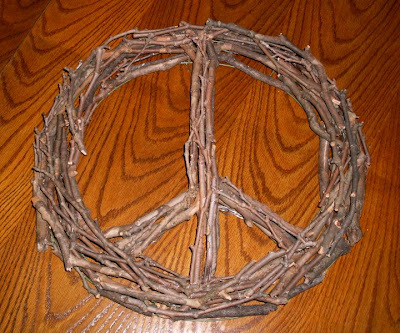 I worked with one branch at a time, holding it here or there, turning and arranging it until I found a spot on the base where it looked good, then adhered it using the hot glue gun. I tried to use some curved branches to naturally follow the circular shape of the form, and I also tried to keep it visually balanced in terms of putting an equal amount of the same sized or same thickness branches around the base - meaning, I was careful to not have one side or section look to thick or "heavy." Balance! 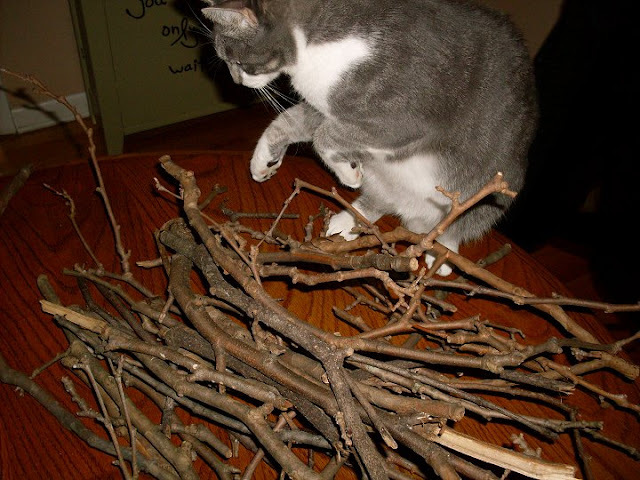 I repeated this process of adhering branches all around until the entire base was covered with branches. All of your friends will be envious! Very cool! 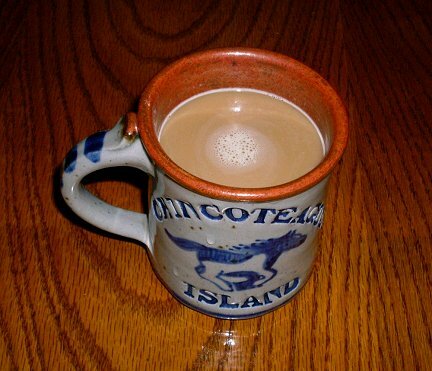 Going to make one for myself and my Mamma! I'm so on it! Love. You should! I love mine! This is a great project. I was wondering if you glued the branches on individually or do you use any wire to adhere them? I'm eager to try this! very hard to get branches glued on to wire form. Any suggestions? Kathy, I used a hot glue gun with a lot of glue to adhere my branches, and I did use a lot of glue when I adhered them to the wire base and then later covered up any large gobs of glue with smaller branches, but you could also use an adhesive such as E6000, but that would need to dry overnight. I would just make sure that they are completely dried out. Love this idea, Laura! Thanks for sharing a great tutorial!! I absolutely love this! I'm definitely going to try one for myself. Thanks for the easy to follow instructions.